With a slight delay, I thought we’d finally take the time to review Marvel’s 2004 mini-series Powerless, written by Matt Cherniss and Peter Johnson, with art by Michael Gaydos, which features slightly different takes on Matt Murdock, Peter Parker and Logan, and many other characters from throughout the Marvel Universe. And there’s a reason I’m not using the names of their costumed alter egos here since Powerless, as the title suggests, takes us to a place where there are no superheroes and being blinded by radioactive goo or bitten by a radioactive spider leads to nothing good. Powerless can legitimately be called an alternative universe story, but it’s unlike most other such stories in that it’s actually pretty good. While it’s certainly not on par with a series like the brilliant Daredevil Noir, it’s similar in that it takes themes we’re familiar with and completely re-imagines how things might have turned out. However, it does so in a way that is much more ambitious and clever than the vast majority of stories featured in series such as What If? This is also an alternative universe with a twist in that the person who takes on the role of narrator, a certain Dr Watts, is haunted throughout by the sense that this world he wakes up to one day in a hospital bed is somehow not the real one and he keeps getting visions of a world of superheroes. Dr Watt’s real identity is revealed on the final page of the series and actually had me go “whoa!” even though it’s not really a shock in retrospect. I won’t spoil anything for you except to say that the entire premise of the story is quite intriguing. Dr Watts is the glue that ties the various plot elements and characters together. As a psychiatrist, he’s got many patients familiar to any Marvel reader, and he continues to run into many other well-known faces as the story progresses. As mentioned before, the three main characters from the regular Marvel Universe who make more substantial appearances include Peter Parker, a new patient of Dr Watts’ who is dealing with the recent passing of his uncle, having his arm disfigured after being bitten by a poisonous spider(!) and being the geek in school. As an intern at Stark Industries, he picks up additional problems along the way when his best friend’s father – a certain Norman Osborn – starts threatening him to get information on Tony Stark’s most recent project. 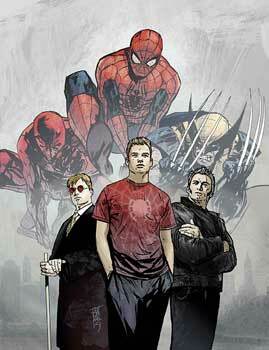 Peter’s story remains compelling throughout the mini-series and uses themes from the regular 616 in interesting ways. Matt Murdock, a blind lawyer from Hell’s Kitchen, with no superpowers whatsoever, contacts Dr Watts because he wants his help on a case. He’s defending a certain Frank Castle who stands accused of killing a certain Leland Owlsley. Matt is sure that Frank is innocent and that his confession – which came after 36 hours – was forced, and needs Watts to see Castle for an assessment of his mental status. The true culprit is, of course, none other than Wilson Fisk. At his side, as always, Matt has his partner Foggy. 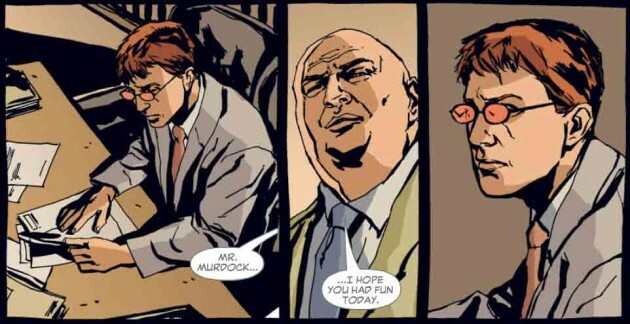 In general, the non-powered Matt Murdock feels very much like the same character that we know from the comics. I also enjoyed seeing the non-powered blind Matt still being able to beat poor Foggy in a friendly boxing match. In other respects, Matt’s story in this mini-series is quite dark, but he remains true to his ideals and while his fate is tragic, his bravery and resilience are uplifting at the same time. Logan makes his appearance in this story by crashing into Dr. Watts’ apartment and threatening him. He’s got his familiar amnesia, but his claws are contraptions that go on the outside of his hands rather than through the skin. While he doesn’t have a healing factor, his character seems the most similar to his 616 counterpart and his story remains, to me anyway, the weakest of the three. A long list of other familiar characters make cameo appearances in Powerless, including Bruce Banner, Sue and Reed Richards, Dr Stephen Strange, Mystique, and Emma Frost. We also see none other than Brian Michael Bendis himself show up in the role of a patient of Dr. Watts’ and the whole thing is pretty funny. I quite like these cameos and enjoy the take on all of them. In general, this is a very good mini-series that I can see most Marvel fans really enjoying. It’s well-written, well-paced and deals with many interesting themes. One of them is definitely the idea of destiny. Even without their superpowers, many of the characters end up living out the same kind of conflicts and events that we’ve seen in the 616 universe. The series ends on a high note as well. The art is by Michael Gaydos, whom we know from his work on Daredevil: Redemption (though this series precedes it). I like the art, but don’t love it. It’s to the point, does the story justice, but is a little on the dark and “inky” side for my tastes. Powerless is available through Marvel Digital Comics Unlimited or as a trade paperback, easy to find on Amazon.com and through other retailers. I really recommend that you check it out. Powerless is a perfect example of what an alternative universe story should be in that it actually feels relevant and tells us something new about the characters involved. Damn, I read this series ages ago, back when I was first coming back, got the single issues on ebay for cheap. I really liked the series, it borders on FanFic but not quite in the Millar way. It knows what it is doing and is conscious of the decisions it makes. It’s not perfect but it was damn fun to read. I think you hit the nail on the head with this review. V.intriguing idea I like the sound of it. I read one of those “What If” compendiums recently, they were fun. Really solid review. I particularly agree about the characterization of Matt here, and the “inky” art. Welcome back, Andrew and thanks for your comments! I hope to have quite a lot to blog about this month so I hope to see you around.